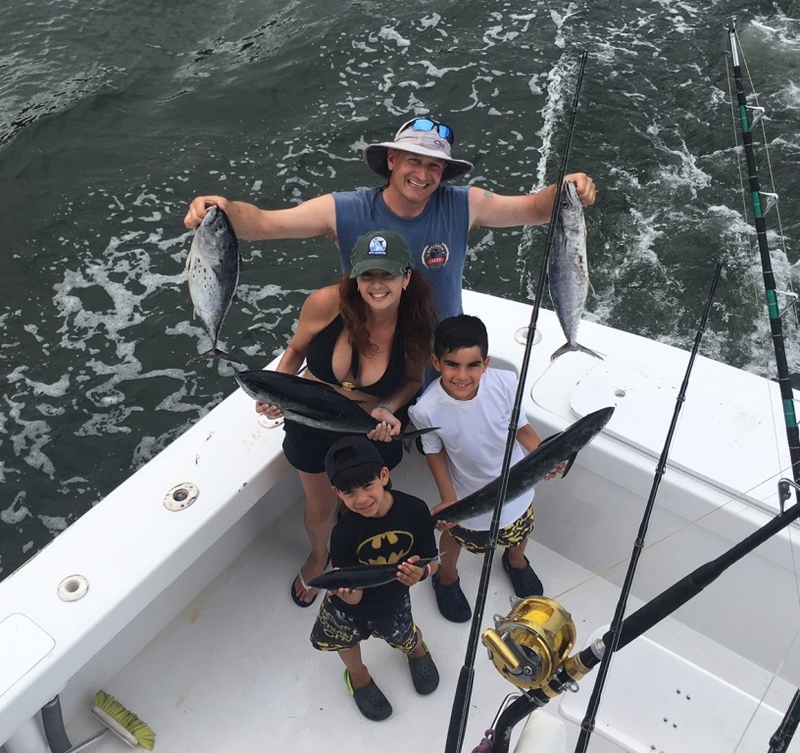 Our Fort Lauderdale fishing report has some good news this week. Fishing for Dolphin has been poor, not only off Fort Lauderdale, but Miami and the Florida Keys. This has changed in just the last few days. Our all day fishing trip yesterday was just for Dolphin, it’s what they wanted. 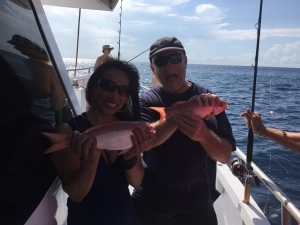 Our fishing trip took us quite a ways off shore but we did catch them! There was scattered weed and debris, a good sign in catching fish. Birds were also aiding us in finding our prey and were the major contributor. We probably caught close to 30 Dolphin; the downside was only 8 were keepers. The rest were too small to keep. Still, they kept us busy on and off all day. Back closer to shore, fishing for Kingfish and Bonito in the reef area has been good. Even 4 hour trips have been having great success. 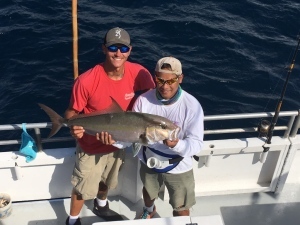 The Bonitos have been biting best first thing in the morning and the later afternoon. Kings have been scattered but nice size, small to medium weights. And just outside in slightly deeper water, Blackfin Tuna have also been helping with our quest. Most are on the small size but some really nice ones have also been caught, up to about 25-30 lbs. We even find them mixed in with the Bonitos on the reef. With all this action and the migration of these fish, fishing for something big like a shark has also been good. We don’t always get the bite but its unusual not to. The occasional Amberjack and Grouper are also attracted to the big baits. 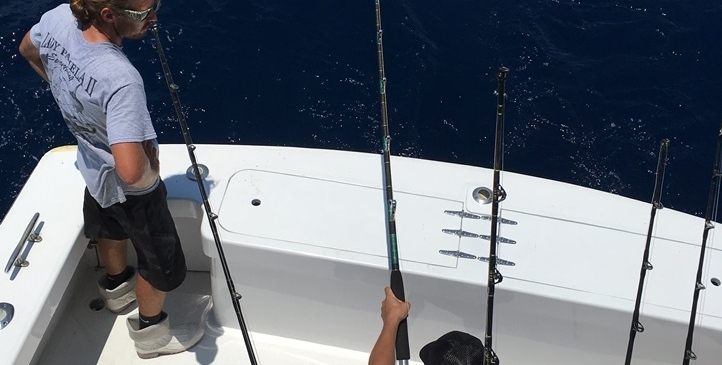 Bites from migrating Sailfish are also in the mix. It’s always nice to catch one of these on the troll. Though it’s not really their time of year, we catch them, or can, year round. It is a nice surprise when it happens. Secondly, allow a proud father to gloat just a bit and send my congratulations to the Hatterascal Fishing team. 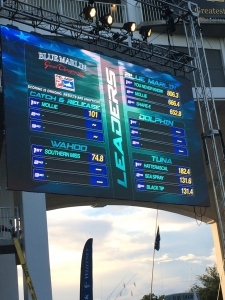 My son is the 1st mate on the boat and their tournament record breaking Yellowfin Tuna won the Tuna division in the Blue Marlin Grand Challenge in Orange Beach, Alabama. Congrats to angler and crew! Well, that’s it for this Fort Lauderdale fishing report. The picture shown is a recent trip on the reef. These guys were quite delighted. I am always being asked when is the best time to fish, meaning when will we catch the most? Is the best time morning or afternoon? And a general rule of thumb is the early morning or late afternoon. When the sun is low in the sky, the shadows from feeding fish do not alert other predators to their presence and they feel more at ease. The surface of the water is also cooler at these times. Fish being cold blooded, feel the temperature differences quite easily. So when is the best time to fish? When you can. There’s no two ways about it, you can’t always be out at the crack of dawn or at sunset. Our trips are scheduled so we get a little of each of these times on the morning and afternoon trips. I’ve heard some people like to sleep in, especially when on vacation. Other people, like me, are early risers and looking for things to do in those early morning hours. And for this report I’m taking about Michael, Mike and Megan, 3 folks that had an afternoon 6 hour. And we had a ball! It was convenient for them to be out in the afternoon and though the best time to fish wasn’t needed, it became the right time. I’d fished the morning trip and we’d caught a few fish, mostly Bonitos and a Tuna. Small, and I mean small, Barracuda’s have also been around and tearing the baits up. While the action was OK that morning, the afternoon proved to be tops that day. Trolling started out slow, a Bonito was caught by Mike and then a bit of a lull as we worked our way south. With 6 hours, we had time to roam and a fairly swift current to the north made south the logical choice. We’d caught a few fish when 3 lines went off at once. With everyone reeling, lots of moving rods to keep things untangled. Blackfin Tuna had attacked our baits, not huge ones, but nice enough in the 4 to 6 lbs. range. They fight hard and are delicious! We managed 2 out of the 3 for our box. As time went on we picked at fish. Tuna, Bonito and a few Kings were caught. Michael seemed to be the videographer while Megan and Mike did most the reeling. 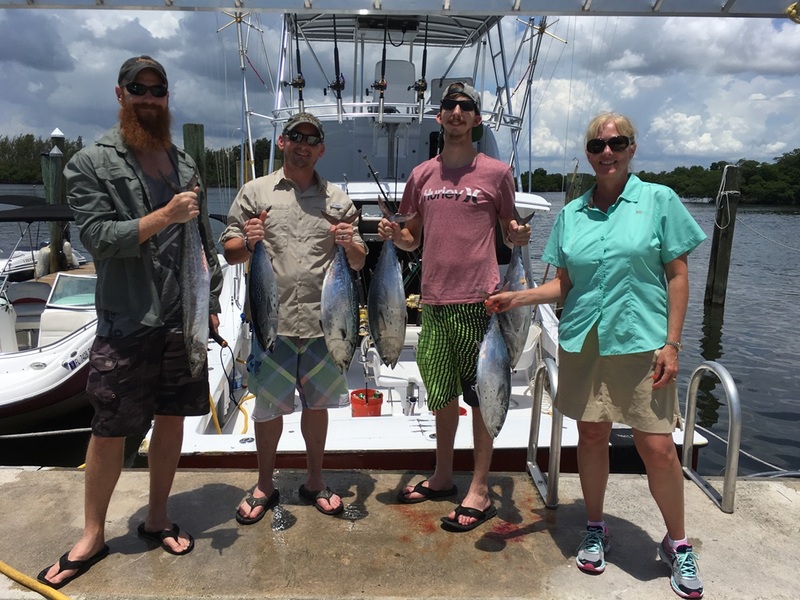 And in the end, we had 7 or 8 nice Tuna, 3 Kings, some Bonitos and a few of those little Barracudas. 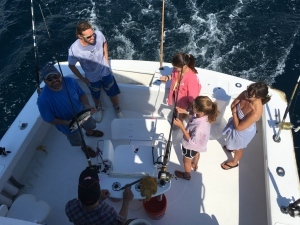 And it was time to switch tactics and try for something big… Megan wanted to catch a shark! Our first strike, which took almost an hour to get, was a bottom bite that bent the rod over good. 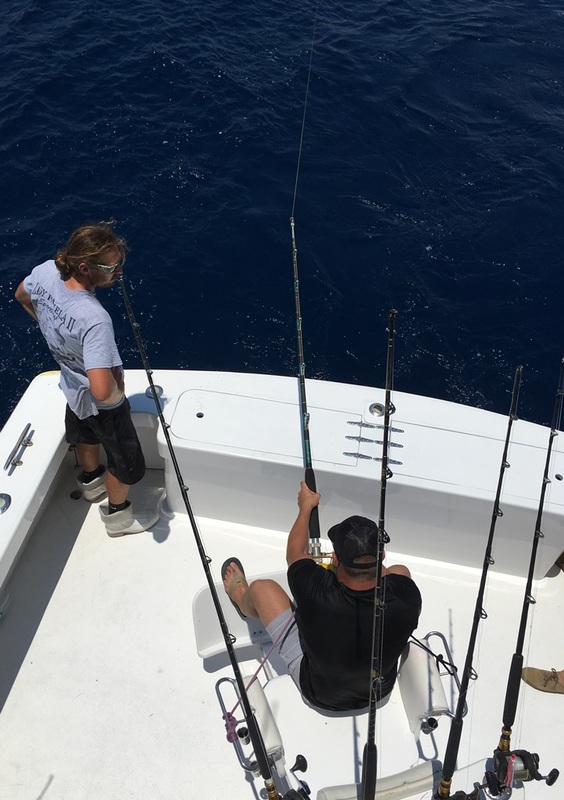 We pulled ahead on the fish only to have some line ripped from the reel and then go slack. We waited to see if he would return but soon ended up retrieving the line only to find we had been plucked. No bait remained on the hooks and let me tell you, this hasn’t happened to me more than 2 or 3 times in my entire career. I mean not a single strand of skin or fish was left. Nada, nothing, zero and zilch. As we re-rigged our bottom bait a strike came on the top bait. This was a zing pow hit, the zing being the ripping of line off the reel and the pow being when the line parted. It is seldom we have a main line part, we are meticulous about the care of our rods and gear. But it can happen and today, it did. So, when is the best time to fish? 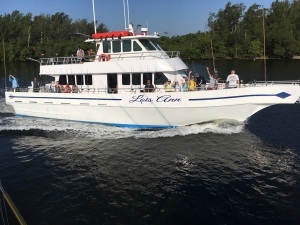 When you can spend some quality time out on the water with friends or family? That IS the best time to fish. And let the fish take care of the rest. 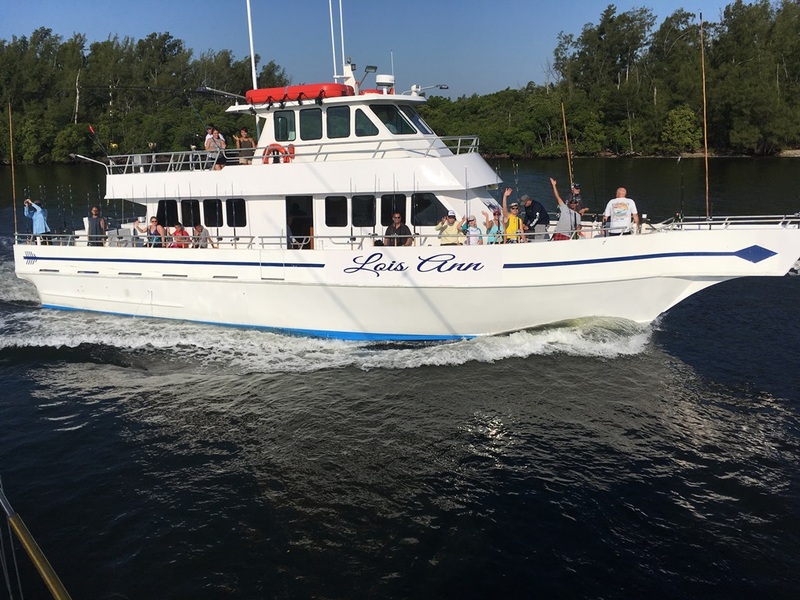 At Fanntastic Fishing we are happy to offer our NEW drift fishing boat, the Lois Ann. Drift fishing is an inexpensive way to get out on the water for one of our 4 hour trips. You can relax and maybe even catch some fish! That is, if you have the patience and touch. I started on drift fishing boats years ago and while some things have changed, others have not. The boat is guided by the breezes and currents. Each person has their own rod, reel and is baited up and ready. The captain and mate will tell the group how many arm lengths of line to put out, and if all follow directions, those baits look like a school of fish. Our drift boat needs a minimum of 10 people to sail and can carry 60, though we often limit it to less. You stand at the rail or sit on the bench and hold your rod the entire time while the bait is in the water. And… You have to hook them to cook them to be successful at this. All in all it’s a great way to spend a few hours and hopefully bring home some dinner. 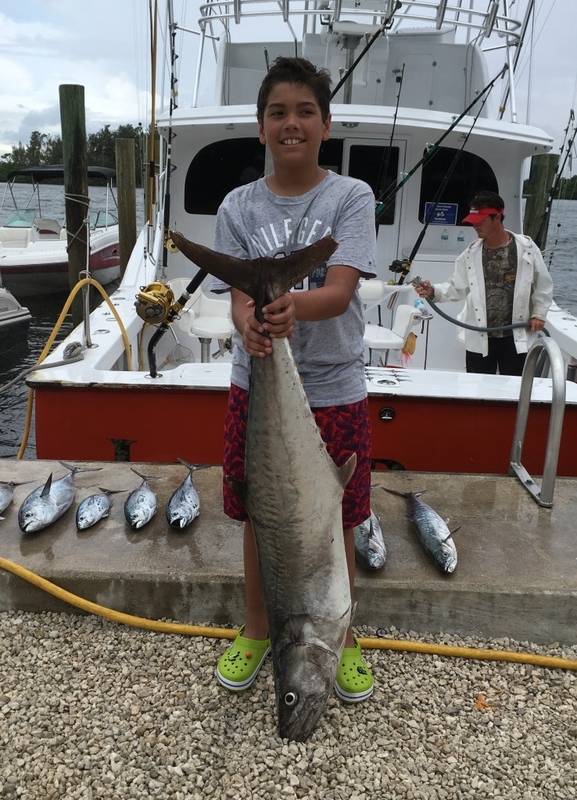 Our catches can include a variety of Snappers and Groupers, Kingfish, Bonito, Tuna, Dolphin, Triggerfish and others. Some are on the small size like Vermillion Snappers. Others can be quite large like the Amberjacks. The conditions each day somewhat determine where and how we will fish. Strong winds or fast currents make bottom fishing tough so we opt for true drift fishing as it was back in my day. A lack of wind will have you fishing bottom because the drift is so slow. Our evening trip is usually an anchor trip with chum for mainly Snapper. We may have to move once or twice if the sharks show up. Drift fishing can be lots of fun. We provide everything you need to fish including licenses and permits. Your catch will be marked and cleaned back at the dock. Feel free to bring your own food and beverages for the trip. We have a large cooler for you or a small personal cooler is allowed. Please, no glass bottles. Alcohol is permitted but no hard liquor. 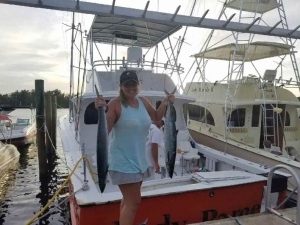 The this week has been pretty good in Fort Lauderdale fishing. We’ve had some great weather, that is if you like soft breezes, calm seas and sunny skies. And while I personally would like to see some improvement with the Dolphin fishing, on other fronts our guests are quite happy. And then there was Mark, just 1 man for an afternoon trip. Now, you might think only catching 2 fish on a 4 hour trip isn’t very good. But when you fight the first one for 30 minutes and the second for over an hour? That can take up some of your fishing time! Mark was quite pleased with both his battles. 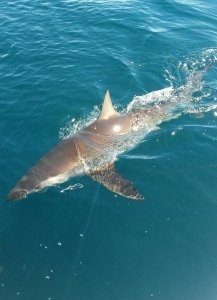 A video has been posted on our Facebook page of a Spinner shark we caught yesterday as well as a picture here. This fight also took up some of our time but was well worth it for Eduardo and his family. If you’d like to check it out, you can find it at Facebook under Fanntastic Fishing. We will also be starting an Instagram page, as soon as I figure out how to use it. LOL Maybe my daughter can help with that. The off shore scene has been more miss than hit with Dolphin. This time of year used to be our BEST fishing for Dolphin. When we have found them, many have been too small to keep. But again, if you don’t try… everything changes and at any time. Further out the Swordfish bite has been pretty good. I have to rely on feedback from others on that note, we haven’t been out fishing for Swords now in a few weeks. Well, that’s it for our Fort Lauderdale fishing this week. For a more up to date report, just drop us a line or give me a call. July is just around the corner and as always our temperatures are heating up. But so is the fishing, that is, if you are interested in quantity and not size.Not to say there aren’t some sizable fish to be caught in the deep sea, there are. But this time of year our method to catching fish is mostly trolling dead bait, lures or a combination of both. Covering the area looking for schools of Dolphin, Tuna, Wahoo, Kingfish with a few Sailfish mixed in. This week has been a mixed bag as far as what we’ve been catching. Bonitos are plentiful most days with a few nice sized Tunas mixed in. It’s the early morning or late afternoon bite that has been best. This is almost steadfast in fishing no matter where you are. The sun being directly overhead tends to drive the fish deeper and our deep baits are what produce most between 10 am and 3 pm each day. Only a few Kingfish are being caught right now but Dolphin are making sporadic appearances with our easterly winds. This time of year the Dolphin are small, some too small to keep. But they are still fun to catch and release and the big ones can be just around the corner. This week I chose my biggest guy on a shared charter with our smallest fish of that trip, a Blackfin Tuna. You can see the crowd he attracted from his catch. We already had some Bonitos and a few Kings in the box. We added some Tuna to this one and all were bigger. But don’t let the size fool you. These are sushi grade Tuna and delicious! We often cut one up on board and serve with Soy and Wasabi. Not like what you get in the can, not at all. I have been writing fishing reports for the Fort Lauderdale area for years now. There are times when the fishing is great and there are those when the fishing isn’t so hot. I’m always trying to keep things upbeat and positive because if you fish? A positive attitude is important. This week I had two specific trips I will talk about. Neither one had spectacular fishing by my standards but one trip was quite pleased and the other very disappointed. And just what is it that makes a fishing trip great? You might think the fish you catch but that’s only part of it. It is also an attitude of why you are going fishing. Each day we greet new people at our boats and hope to make their day special. Some people are easy to please and some are not. LOL Some have expectations that aren’t realistic and I happen to be one of those people. I expect to catch great fish each day. But we all know you can’t win every battle and certainly cannot catch a great fish for every customer. Boy, wouldn’t that be great? For me it would. So now we come to the fishing lately. Seas have been calm, light winds from the west and some pretty good thunderstorms popping up in the afternoons, our normal weather pattern. And this will continue for quite some time which means our top baits don’t get the attention our deeper baits do. Kingfish, Bonito, Tuna have been preferring the deeper baits lately and with some nice sized Tuna mixed in with the small. Those west winds I spoke of blow the debris and weed off shore and the Dolphin fishing has been less than stellar. So now we start our trips, always searching for fish. Schools of smaller fish can lead to bigger bites. 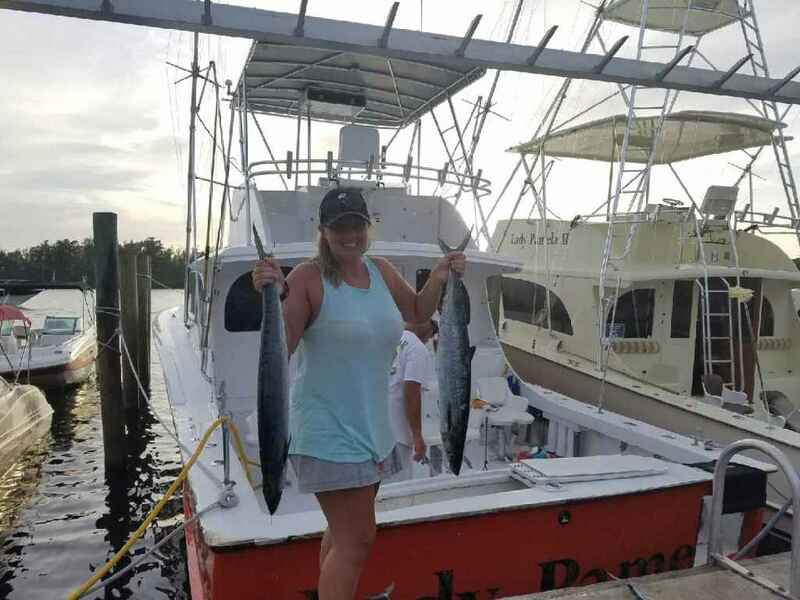 Wahoo, Sailfish and other predators like to be around small Tuna and your chance of catching something cool beneath the school is high. I realize they aren’t big but small fish can lead you to bigger. And that is ALWAYS our goal. To catch fish! I also had an all day trip this week. Four guys showed up with beer, booze, snacks and sandwiches. They had been with us before in less than great conditions. Rougher seas, nasty winds and so on. These guys were thrilled with each fish reeled in. 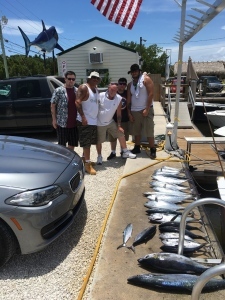 They caught a few Kings, some Tuna, a few Bonitos and a large shark. It was really kind of funny as it was hot that day so they spent most their time in the A/C of the cabin, only to exit when Freddy would call them out for a bite. Then the phones came out to take pictures and the trash talk started. Both these trips caught fish. The one trip was delighted with their day and I truly believe that had they caught nothing it wouldn’t have dampened their spirits. They were out to have a good time and were bound to do it no matter what. The other trip left disappointed and unhappy because they didn’t catch their big fish. Fishing is fun, no matter what you catch. 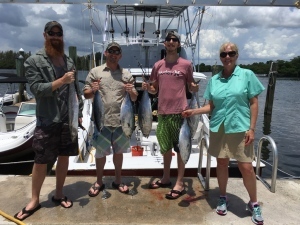 We hope when you do come fishing with us, you come to have some fun and catch some fish. Because that is what we are trying to do each and every day. 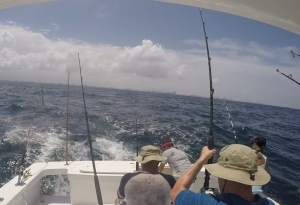 Let’s have some fun… Fishing off Fort Lauderdale. 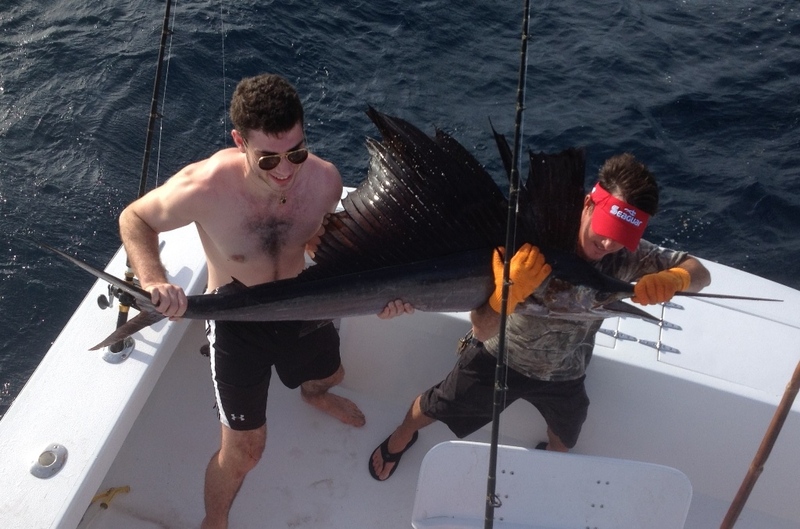 Fishing in the Fort Lauderdale area doesn’t always provide us with a great catch. But today it was GREAT! I’d like to introduce you to Sebastian. He and his family came out with us this morning for a 4 hour trip. Sebastian, as many of our guests, had never really done any kind of fishing, certainly not this kind. And one great thing about newcomers is they have no bad habits to break. Sitting in the big chair, he was handed the first bite, a small Bonito. It had bitten a top bait and he was taught how to work the rod and reel, he picked it up quickly. You don’t wind when you lift the rod and you don’t jerk the rod up either. He listened to Adam’s instructions and did a super job with his first fish. Next came a deep bite on one of the planer rods and dad was up. Another Bonito and those planer rods are not worked as the top bait rods. It’s important not to lift and then wind for a moment of not winding or too quick a drop can reset the planer and now you’re fighting that rather than the fish. A double hit had both his sister and Sebastian reeling and things were going along so well. In just a little over an hour we had caught everyone a few fish including some nice Kingfish. One was too small and had to be released but the others were kept. We had no idea what had hit. A Sailfish? Maybe… Some big Tuna had also been around… No jumping going on so probably not a Sail. We were finally able to stop the fish and Sebastian began retrieving some of the lost line as best he could. And we ALL were excited to see what we had on. This fish was angry and kept peeling line off for short bursts but Sebastian kept grinding away until finally, after about 25 minutes, we got a glimpse of the fish. Long, slender and silvery in color as he flashed below the boat… It was a big Kingfish, certainly the biggest I have seen in a while. Some dancing around below us trying to evade Adam’s gaff and this is usually when you lose the big ones, becoming anxious for it to be done. But not Sebastian, he stayed steady and cool, probably because he was exhausted. We don’t mess with big Kings on the boat, their teeth are small but extremely sharp and it’s best they go straight into the box. This picture taken at the dock tells the end of this story. This tough little angler had a hard time holding the fish up and let it rest on the ground for the picture. You can see the rest of the catch lying behind him. When you are this big and you catch a fish that big? 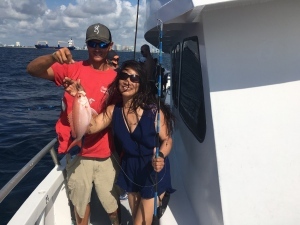 Fort Lauderdale fishing is great! We talk about kite fishing in our fishing reports and to our guests at certain times a year. Many first timers have never seen it done and have no idea why it is so productive with certain species of fish so I thought I’d take a moment to explain the art of kite fishing. To begin we have to look at nature and how animals eat. Most land based animals chase their prey down. Speed and agility are what allow them to catch prey and, of course, prey has the ability to escape. Some burrow in tunnels, some have tremendous speed and others might have armor or the ability to bite back, always a deterrent. Those that can escape by flying up or beneath the surface of the land have the best shot at living another day. When fish are looking for food, they see up toward the surface. Bait fish are silhouetted by the light of day and are easily seen from below. Most fish chase the bait fish to the surface where escape must be done with moves right, left or speed straight ahead. By chasing a school of bait fish, the weak fall behind and are singled out, just as predators do on land with herds of animals. So, now that we have shown that fish prefer to eat up near the surface of the water, here is where fishing with kites comes into play. We’ll just go ahead and create the perfect eating position for a fish by dangling a bait fish on the surface. Here it is… come and get it! 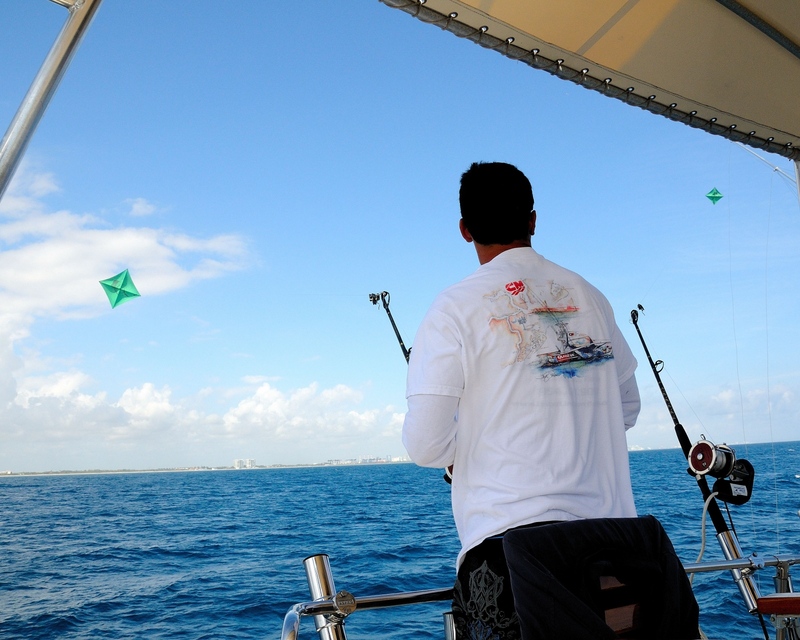 We happen to use two kites at a time usually, allowing us to present more baits for more opportunities. The kite is launched from the flybridge on its own rod and reel. Clips similar to our outrigger clips are placed on the kite line in various ways and spaces and the kite is sent out away from the boat with a fishing line and bait that is also taken away from the boat. These clips are spring loaded and the tension is set so that when a fish eats the bait, the clip releases and the kite stays in the air. The fishing line also has the ability to slide through the clip so we can feed the fish without any kind of tension or pressure being felt by the fish. Since our kites are essentially sky hooks and we’re dangling our baits on the surface, virtually no tackle is in the water for the fish to see. The bait fish is aware he is in a bad, unprotected place and constantly tries to swim deeper into the water where he has a chance to escape. That struggle sends out vibrations that predators feel, just like we hear, and they are attracted to investigate. One of the great things about kite fishing is you usually get to see the bite when a fish comes along. Sailfish are usually quite obvious as they appear from the side or below the bait. Mahi-mahi are also quite easily seen streaking across the surface toward the bait. Fish like Tuna, Kingfish and a few others feed by accelerating toward the surface from beneath and are rarely seen before they make a splash at the bait’s position. Depending on the type of fish eating, the line is either paid out to allow time for the fish to eat, or in some cases, the line is made tight to set the hook quickly. The boat is put in gear to help get some of the slack out, it does go all the way up to the kite line and back to the surface, and with luck, the hook is set, the clip releases the line and the angler is now tight with his fish. Since fish like Sailfish and Mahi-mahi usually travel in groups, leaving the rest of the spread out can mean more hook ups. And of course, pitching baits from the boat aids this as well. While kite fishing is mainly done for catching Sailfish, almost any fish can be caught by this method. Live bait is best but dead bait can also be used. Sailfish have a very high rate of success fishing this way, around 80% or better. Other species, like Kingfish, have a lower rate of success, somewhere around 50%. It’s usually the smaller fish that escape. While fishing with kites does have its advantages, there are disadvantages as well, but only a few with the main one being mobility. You are somewhat limited to where you can go with the baits up in the kites. Short of reeling everything in and re-setting, mobility is dependent on wind and current. So instead of finding the fish, you attract them to you. Other things we do aid this but… we can’t give all our secrets. So now you have an idea of what the fishing kites do and how they work. 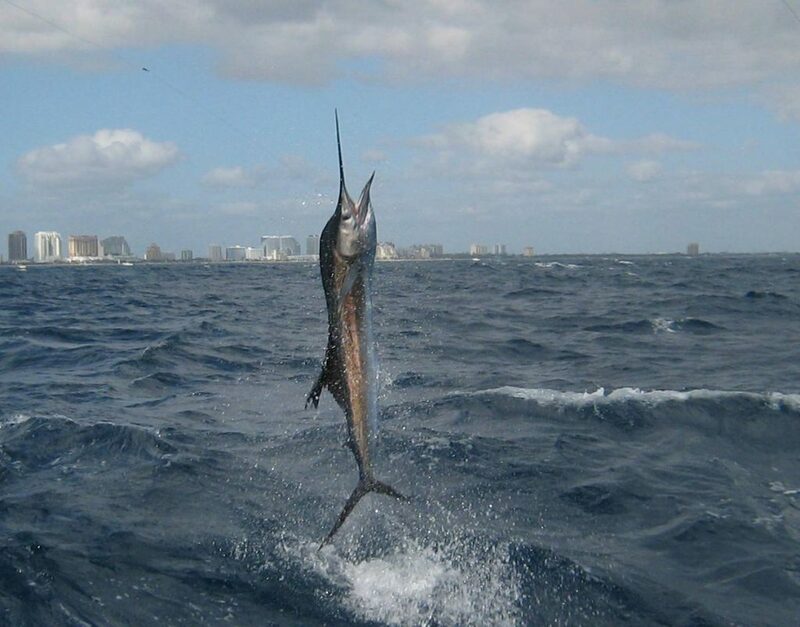 In the winter months, our best time of year for fishing for Sailfish, you may be asked if you want to buy live bait. At least now you’ll know how they are used. One thing about fishing is… It never works out well for the bait. 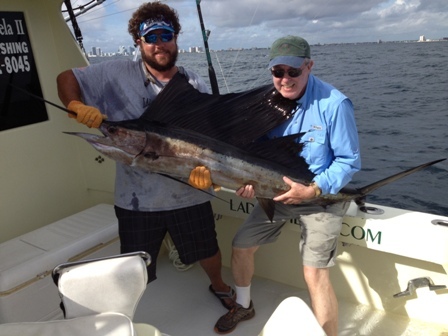 It is not always that people that fish with us here in Fort Lauderdale want to catch something big. Many times they just want fish and the focus is not on something large. 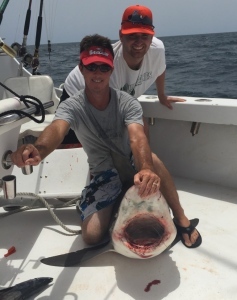 But when Tom and Brian showed up at the dock early today, their goal was hoping to catch a shark… A BIG shark! And with a 6 hour trip ahead of us, we felt we had time to a little regular fishing as well as target something big. With light winds and only a slight chop on the seas, we ventured out to find some green water as far as the eye could see. Not a bad color water for Tuna, Kingfish or shark, but not great for Dolphin. We spent our first few hours trolling and caught some Kings and small Bonitos on the reef area fairly close to shore. 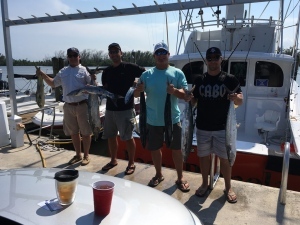 With a limit of only 2 per person, our Kingfish limit was reached and we ventured out to where the big ones are. This is where patience is important… You usually have to wait for your bite and after deploying our baits? We waited and waited… And waited… The light current today was not helping our quest. The current carries the scent and predators down current pick this up and follow it to our baits. And after over 2 hours of this, we were running out of time. I have to commend both Tom and Brian. They were quite content with what we had already caught and were willing to tough it out. Go big or go home. Their perseverance paid off. Our bottom rod took a big bounce, relaxed and then doubled over as line peeled off. It takes a mere second to go from waiting to action and now we had other baits to clear before the fight began. With Brian in the big chair, he began following first mate Adam’s instructions as I kept the boat over the fish. At times, we couldn’t budge this stubborn fish that had yet to be identified, other times we were able to retrieve some line, only to lose it again as the fish kept peeling line on his runs. It took Brian about 30 minutes to get the fish close enough to the boat for our first sighting which didn’t last long, the fish took off and was deep again. We knew it was a shark, just not sure what kind. Another 10 minutes and he was back at the boat and finally under our control to be boated, measured, tagged and released… Sandbar Sharks are protected. Thanks To and Brian for your attitude in what we do. You make our job easy. For this fishing report for the Fort Lauderdale area, I’d like to talk a bit about size and kids. I am always asked “what’s the biggest fish I’ve caught”? Truth be told, I hope I haven’t caught my biggest yet and many of my customers have caught larger fish than I have. After all, how would people feel if I were catching their fish? A recent trip with these 2 young boys had me reflecting on this very question. One great thing about kids is that they get excited no matter what size the fish is. They needed help in reeling the fish in, even complaining they couldn’t do it anymore to which Robert and Sean prompted them on. A hand was added to the handle to help land the fish they caught. They felt pride and excitement even though they needed help at their new BIGGEST fish! And that, ladies and gentlemen, is what keeps me coming back to work each day. So… what’s YOUR biggest fish? It doesn’t really matter if you’re young or old. Size is relative to your size and what you’ve caught in the past. Maybe that’s why kids are so easy to please. As for what we’ve been catching? Small Blackfin Tuna with some really nice, big ones have been biting. Kingfish on the reef with Bonitos mixed in and each day we hope for Dolphin, but they have been coming and going with no regular schedule. Fishing for sharks has slowed but if you reel your fish in too slowly, you stand a chance to lose it to a shark so they are still around. The main thing is we’re catching fish and having fun doing it. And that’s all for now for the Fort Lauderdale area and this fishing report.